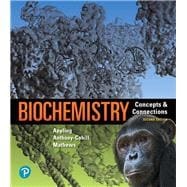 by Appling, Dean R.; Anthony-Cahill, Spencer J.; Mathews, Christopher K.
Biochemistry: Concepts and Connections engages students with a unique approach to visualization, synthesis of complex topics, and connections to the real world. The author team builds quantitative reasoning skills and provides students with a rich, chemical perspective on biological processes. The text emphasizes fundamental concepts and connections, showing how biochemistry relates to practical applications in medicine, agricultural sciences, environmental sciences, and forensics. The newly revised 2nd Edition integrates even more robust biochemistry-specific content in Mastering™ Chemistry, creating an interactive experience for today’s students. New Threshold Concept Tutorials help students master the most challenging and critical ideas in biochemistry, while Interactive Case Studies connect course material to the real world by having students explore actual scientific data from primary literature. The 2nd Edition provides a seamlessly integrated learning experience via text, Mastering Chemistry, and an interactive Pearson eText. Students can further master concepts after class through traditional and adaptive homework assignments that provide hints and answer-specific feedback. The Mastering gradebook records scores for all automatically graded assignments in one place, while diagnostic tools give instructors access to rich data to assess student understanding and misconceptions. Note: You are purchasing a standalone product; Mastering Chemistry does not come packaged with this content. Students, if interested in purchasing this title with Mastering Chemistry , ask your instructor for the correct package ISBN and Course ID. Instructors, contact your Pearson representative for more information. Dean R. Appling is the Lester J. Reed Professor of Biochemistry and the Associate Dean for Research and Facilities for the College of Natural Sciences at the University of Texas at Austin, where he has taught and done research for the past 29 years. Dean earned his B.S. in Biology from Texas A&M University (1977) and his Ph.D. in Biochemistry from Vanderbilt University (1981). The Appling laboratory studies the organization and regulation of metabolic pathways in eukaryotes, focusing on folate-mediated one-carbon metabolism. The lab is particularly interested in understanding how one-carbon metabolism is organized in mitochondria, as these organelles are central players in many human diseases. In addition to coauthoring Biochemistry, Fourth Edition, a textbook for majors and graduate students, Dean has published over 60 scientific papers and book chapters. As much fun as writing a textbook might be, Dean would rather be outdoors. He is an avid fisherman and hiker. Recently, Dean and his wife, Maureen, have become entranced by the birds on the Texas coast. They were introduced to bird-watching by coauthor Chris Mathews and his wife Kate–an unintended consequence of writing textbooks! Spencer J. Anthony-Cahill is a Professor in the Department of Chemistry at Western Washington University (WWU)in Bellingham, WA. Spencer earned his B.A. in chemistry from Whitman College, and his Ph.D. in bioorganic chemistry from the University of California, Berkeley. His graduate work, in the laboratory of Peter Schultz, focused on the biosynthetic incorporation of unnatural amino acids into proteins. Spencer was an NIH postdoctoral fellow in the laboratory of Bill DeGrado (then at DuPont Central Research), where he worked on de novo peptide design and the prediction of the tertiary structure of the HLH DNA-binding motif. He then worked for five years as a research scientist in the biotechnology industry, developing recombinant hemoglobin as a treatment for acute blood loss. In 1997, Spencer decided to pursue his long-standing interest in teaching and moved to WWU, where he is today. In 2012, Spencer was recognized by WWU with the Peter J. Elich Award for Excellence in Teaching. Research in the Anthony-Cahill laboratory is directed at the protein engineering and structural biology of oxygen-binding proteins. The primary focus is on circular permutation of human â-globin as a means of developing a single-chain hemoglobin with desirable therapeutic properties as a blood replacement. Outside the classroom and laboratory, Spencer is a great fan of the outdoors–especially the North Cascades and southeastern Utah, where he has often backpacked, camped, climbed, and mountain biked. He also plays electric bass (poorly) in a local blues—rock band and teaches Aikido in Bellingham. Christopher K. Mathews is Distinguished Professor Emeritus of Biochemistry at Oregon State University. He earned his B.A. in chemistry from Reed College (1958) and Ph.D. in biochemistry from the University of Washington (1962). He served on the faculties of Yale University and the University of Arizona from 1963 until 1978. When he moved to Oregon State University he became Chair of the Department of Biochemistry and Biophysics, a position he held until 2002. His major research interest is the enzymology and regulation of DNA precursor metabolism and the intracellular coordination between deoxyribonucleotide synthesis and DNA replication. From 1984 to 1985, Dr. Mathews was an Eleanor Roosevelt International Cancer Fellow at the Karolinska Institute in Stockholm, and in 1994—1995 he held the Tage Erlander Guest Professorship at Stockholm University. Dr. Mathews has published about 185 research papers, book chapters, and reviews dealing with molecular virology, metabolic regulation, nucleotide enzymology, and biochemical genetics. From 1964 until 2012 he was a principal investigator on grants from the National Institutes of Health, National Science Foundation, and the Army Research Office. He is the author of Bacteriophage Biochemistry (1971) and coeditor of Bacteriophage T4 (1983) and Structural and Organizational Aspects of Metabolic Regulation (1990). He was lead author of four editions of Biochemistry, a textbook for majors and graduate students. His teaching experience includes undergraduate, graduate, and medical school biochemistry courses. He has backpacked the mountains and floated the rivers, respectively, of Oregon and the Northwest. As an enthusiastic birder he has served as President of the Audubon Society of Corvallis and is President of the Great Basin Society, which operates the Malheur Field Station in eastern Oregon.